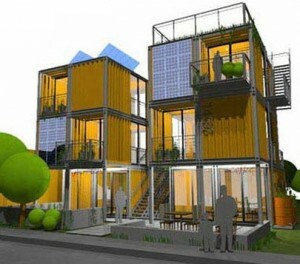 more info about this: Re:build redeployable, modular, low-cost / low-skill building system. @casinclair how abt a refugee housing workshop/pavilion at #CoyoteCreekCamp Silicon Valley, seed #socent to produce low-cost #StartupHouse? “#socent” = social enterprise business. @tmccormick totally do-able. We built the first prototype in Udine, Italy (only an hour from Venice) so we can re-deploy it there. @jenloving23 @sliccardo @casinclair visit suggested to me, start now, there, prototype movable @houslets. I can get materials, facilitators. Sam Liccardo @sliccardo is San Jose City Council member for District 3 (adjoins Coyote Creek encampment), and also currently in runoff for San Jose Mayor. He has proposed and campaigned on a major program to create microunit housing for SJ’s unhoused population, exploring possibilities such as prefab or 3D printed structures. @tmccormick @sliccardo @casinclair @houslets Me too. But land remains an issue. Later on, another thread entered in, via leading Silicon Valley gadfly & critic Vivek Wadhwa’s post in Washington Post’s, Innovations blog: “Come on, Silicon Valley, you can do better than this” focusing on Andreessen Horowitz venture-capital firm’s $1.2M investment in the Yo messaging app. @wadhwa @pmarca Come on, Vivek, you can do better than cherry-picking one example/VC for your point. SV is much broader than that. 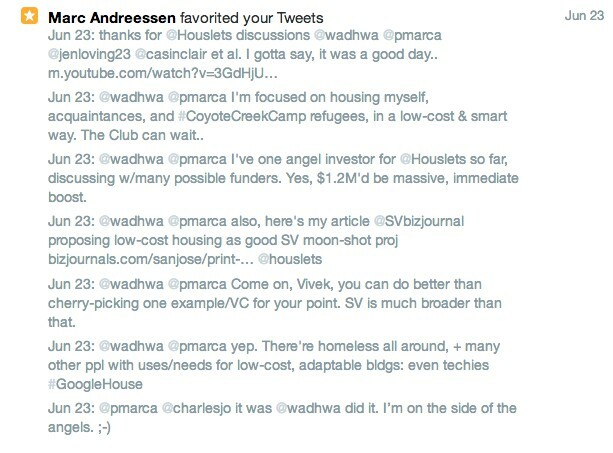 @wadhwa @pmarca I've one angel investor for @Houslets so far, discussing w/many possible funders. Yes, $1.2M'd be massive, immediate boost.
.@tmccormick Sadly, an idea as great as yours would not even get you a meeting with leading VCs.
.@tmccormick If you did get a meeting with the VCs, would waste your time and say "keep in touch, we want to see more progress". @wadhwa we'll see! smaller, smarter, socially- and broader-minded angels 1st, we can prototype/build with that. VCs'll come around later. @wadhwa @pmarca I'm focused on housing myself, acquaintances, and #CoyoteCreekCamp refugees, in a low-cost & smart way. The Club can wait.. I have in mind, for example, Facebook’s Open Compute Project, global open-source building/facility design project for data centers. Large tech cos constantly relocate and house employees, as e.g. energy companies long have. CEO Mark Zuckerberg has long been interested in employee housing, and Facebook offered $600/month to employees in its early days to live within 1 mile of headquarters. FB is currently building the Anton Menlo 394-unit housing complex for employees next to its Menlo Park headquarters – a sort of Silicon Valley, market-rate reinterpretation of “company town” housing. @Wikisteff @wadhwa First they ignore you, then they laugh at you, then they fight you, then they want in on the next funding round. It is heartbreaking to see homelessness and despair even in Silicon Valley. We pretend it doesn't exist; apps will somehow make it right. @charlesjo @wadhwa @tmccormick Trolls gotta troll :-). @tmccormick @pmarca @wadhwa … founders anticipate world problems being solved by a glorified SMS? @tmccormick @pmarca @wadhwa … Because this may be the thread that ignites it. @charlesjo @tmccormick @wadhwa As I'm sure you know, Twitter went through years of being crapped on for being useless and terrible for SV. well, in any case, it got some attention from Andreessen. Such attention is scarce & valuable — good work, Vivek! @casinclair @tmccormick @houslets yes! We need all brains on deck to solve homelessness in the most expensive housing market in the nation. it was a good day for Houslets conversation, and incidentally a nice example of Twitter ad-hoc dialogue and network-forming between disparate people/interests. I give thanks for this moment with the classic Ice Cube track “It Was a Good Day” from 1993, the year Andreessen graduated and moved to California to start Netscape. (see also, “Why Andreessen Horowitz Is Investing in Rap Genius” by Andreessen, 2012).